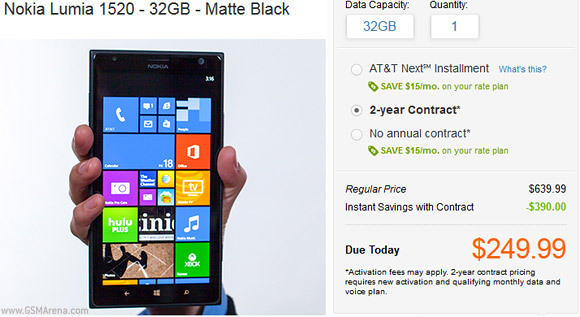 AT&T has added the 32GB version of the Nokia Lumia 1520 phablet on its web store at $250 with contract. Note that only the black version has a 32GB option, while the red (which is selected by default), white and yellow ones do not. Anyway, the normal 16GB version is back at $200 after a temporary promotion cut the price to $100. If you prefer, you can get the phablet off-contract too. The 32GB version is $640, while the 16GB units go for $585. You can't get it just yet as its listed as "Out of stock online", but you can try your luck with a local brick-and-mortar store. Keep in mind that the 16GB Lumia 1520 for AT&T can be had for $150 from Amazon and you can grab a 64GB microSD for $50. The off-contract price for the unlocked 32GB version is around $600. Yes. A SUBSIDIARY of Microsoft. Nokia is less of a brand right now. Swallow the bitter pill.